Daisy Garden is a court in Mario Hoops 3-on-3 and Mario Sports Mix. Daisy Garden is one of the courts to play on in Mario Hoops 3-on-3. The third playable court in the Flower Tourney, it is a garden with many flowers in the background. The court is made of asphalt. There's a twist on this court, however - the baskets are replaced with Petey Piranhas. Two Peteys stand where each basket should be; to score, players must land the ball in his mouth. This proves much harder than one would expect, as the ball slips out very easily. Also, dunking the ball is an extremely difficult task, as Petey will lunge at whoever tries to do it. Petey's presence is never explained, nor is there an explanation for why a double of him is there as well. Dunking on this stage can only be performed when Petey Piranha falls asleep, indicated by a bubble coming out of his nose. Petey Piranha falls asleep approximately every fifty seconds. Dunking three times on him during a tourney allows a blue seed to be collected as an item. Once the player gets this seed and makes a basket, the Malboro Garden court will be unlocked. 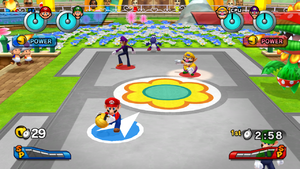 Daisy Garden also appears in Mario Sports Mix as a returning court. The court can be selected for all sports, except volleyball, but there is a mission which makes the player play volleyball at this court; it doesn't have gimmicks though. In dodgeball, Petey appears on the left or right side of the court, depending on which side the players are on. Petey will occasionally spit out a giant puddle of sludge, which will trip players up and momentarily stun them. If Petey's mouth is open, the players can throw the ball into his mouth, causing the giant plant to spit out a massive sludge ball. While players can't catch the sludge ball, it can be dodged and repelled. In basketball, both the players and their opponents' hoops are Petey Piranhas. Much like in Mario Hoops 3-on-3, getting the ball can be quite a hassle since Petey's mouth is usually closed, and if players approach Petey when his mouth is closed, they will be knocked back. The massive plant will open his mouth from time to time, which is the only opportunity for the players to score some points. Petey can also fall asleep, which will make earning points a breeze as well. In hockey, Petey Piranha will randomly appear on one of the six circles found on the court. From time to time, he'll change his position and move to another circle. If Petey Piranha is hit with the puck or with a hockey stick, he will spit out a massive puddle of sludge, which will slow all the players down who come in contact with it. In volleyball, the court is only playable through an alternate route in the Flower Cup. It is unplayable in Exhibition mode, however. Daisy Garden is also a court that's used for the Feed Petey party game. This page was last edited on March 28, 2018, at 12:55.